There's no doubt that we all like to have some spare money in our pockets. Once all our monthly bills have been paid, it's great to be able to treat ourselves. But one problem that often springs up is the thorny issue of how to get cash quickly. 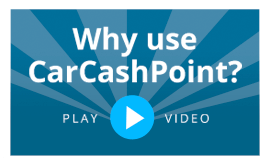 As an instant logbook loan provider, Car Cash Point can help you get cash that you need - fast. We've all felt the pinch at some point. When you've had a particularly heavy financial month, making it to your next pay cheque can feel like a long time. It only happens once in awhile though and you know that necessary outgoings for one-offs like car tax, a boiler service or a new appliance don't happen every month. But what if you were feeling the pinch more often that you should? You might just be struggling through each month and just about coping financially, but you're not able to put any money aside for either emergencies or pleasure activities like holidays or special occasions. So what can you do? We're all familiar with online auction sites where we can list our unwanted items and get cash for them. This is great if we're not on any kind of time limit as it can sometimes prove to be a drawn out process. After listing the item, you can be waiting anywhere up to 2 weeks before you even receive payment, then you've got all the hassle of packing and posting the item to the winning bidder. While it can be a good way to put money to one side and save up, it can take an age to get to where you need to be. So plus points for being an easy way to get money, but no points for being a quick way to get money. When you're looking to get a larger sum of cash quickly for that one-time purchase, luckily, Car Cash Point can help you. Our process is simple and clear - if you own your car outright (and it's free from any finance), Car Cash Point can provide the bigger money you're looking for. So how does it work? Well, a logbook loan from Car Cash Point is a loan secured against any vehicle. Typically, this would be your car, but can be a caravan, motorhome or van. It's an easy way to withdraw the cash from your car or other vehicle. And as we don't carry out any formal credit checks, all you need to do is be able to provide the car's V5 (or 'logbook') document to prove ownership. Once your application is approved, your loan amount can be transferred to your bank account within one hour. Car Cash Point offer you a surprisingly transparent loan with no hidden fees or charges. We also have a best rate guarantee, so if you find another logbook loan lender offering a cheaper rate, we'll beat it by 10%. So what are you waiting for? Call 0333 220 4419 today and speak with one of our loan experts. You could borrow up to £100,000 in minutes and allow yourself that big purchase you've been saving for.